If you have survived your St. Patty’s Day green beer hangover and still haven’t had enough Irish fun, then go to the grocery store and get another corned beef and another head of cabbage— this recipe is SO EASY and is a total crowd pleaser. Honestly– you can’t mess this up and it tastes so good. Try it with different beer… both IN the pot and IN your belly. The variety of beers will alter the flavor of the meat and the cabbage, so try it light or dark, bitter or brown, cheap or expensive—beer and beef, what a great combination! 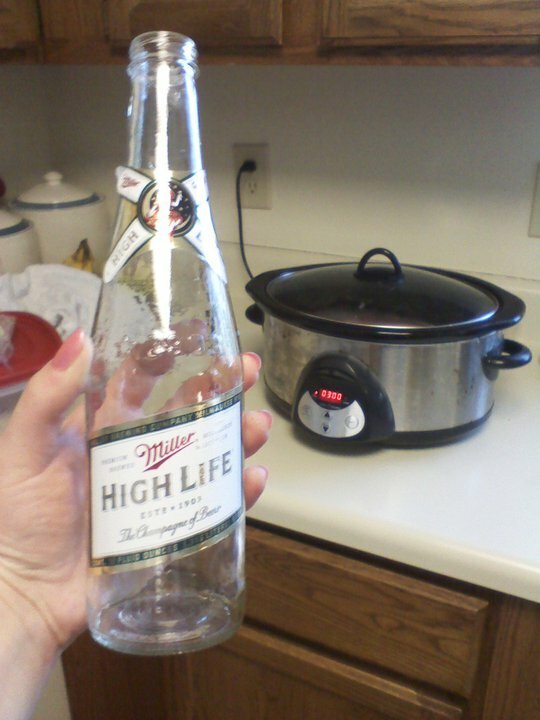 Put the corned beef in the crock pot and throw out the extra packet of seasonings. Pour in the bottles of beer and then add enough water to reach the top of the meat. Cook on high for three hours. Add cabbage and make sure it is immersed in the liquid. Cook on high for one hour more. Remove meat to a cutting board and let it rest for a few minutes. Slice it thin and remove the top inch of fat. Serve with the beer-and-beef-infused cabbage and a cold beer.